← So; what was so great about the 70’s? As the 60’s came to an end there must have been a huge ‘what’s next’ question mark hanging over the nation. 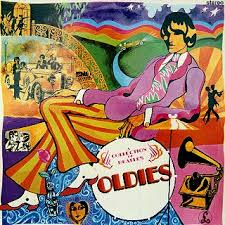 In 1970 the Beatles split, I can’t even remember this which is weird as I can remember the 70s considerably better than last week, I can remember Hendrix dying which at the time I considered no great loss as I had found his guitar styling s somewhat unpleasant to my 11 year old ears. My parents had their own music collection which I played more often than they did on a record player which we had no doubt purchased tax free in Aden. My mum and dad were actually quite radical being early adopters of word music, Bert Kaempferts’s Swinging Safari introduced me to the cyclical chord progressions of Africa. More radical still was the possession of a Black and White Minstrels LP which, I’m sure, induced a love of the blues in later life. A couple of years passed and I started to develop my own musical style and I inherited my parents turntable on the understanding they could have visiting rights should they feel the need to indulge their own musical tastes. 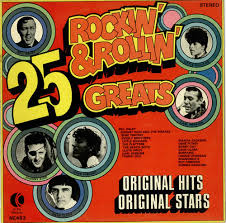 My first purchase was 25 Rockin and Rollin Great on the K Tel record label.K Tel flourished in the early 70s with their cheap and cheerful offerings. Cheap is a relative term I’m sure it cost me the equivalent of 14 years pocket money. In fact I didn’t even actually buy the record, my mum went out and bought it for me, pretty pathetic I know, all I can say in my defence is that as soon as I managed to build up the courage to go into a record shop I spent most of the next 10 years in one establishment or another. Anyway the K Tel di sc was pretty good, or so I thought. It had all the requisite tracks by the likes of Bill Hayley and Little Richard, no Chuck Berry, mores the pity, but enough to give me hours of pleasure. My mate Phil also owned the same album and the amount of pleasure we got by discussing it track by track during school dinner breaks was almost indecent. In retrospect there were two major flaws with the record, firstly some of the tracks had been re recorded. This is something I got wise to over the years and is something to be really aware of when purchasing implausibly cheap CDs from garden centres and petrol stations. Re recording only usually happens when a band or artist needs to make a quick buck and can make some cash in hand from a couple of days in a recording studio in Hungary. The worst crimes against humankind happen when not all the band (worst case, just the drummer) claim right to the name and re record the old hits with a load of session musicians. The other flaw in my initial purchase was that some of the tracks had been recorded in mono and subsequently doctored in the studio to create mono. In 1972 this just didn’t work on any level but by and large it only offended people with really good stereos and I wasn’t one of those. For the entire 70s I had the same record player which consisted of a turntable with two attached speakers which could be clipped to the turntable to make the heaviest suitcase imaginable. My third purchase was where I lost the plot a bit. 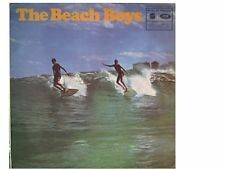 I bought a Beach Boys LP from a department store. My main interest in it was it was cheap which to be honest has infuenced a lot of my purchases since. I knew the Beach Boys were famous, just like the Beatles in fact so assumed I couldn’t fail. Alas it was a compilation of tracks that could have been picked by a blind monkey and covered their first recordings up to just past Pet Sounds. It was OK but I felt a bit cheated and it led to anger issues with the Beach Boys in later life. When looking for an image on line I found someone is trying to sell it for 4.20 Euros. Do not buy it!!! This entry was posted in rock music and tagged 1970's, 70's biography, 70's music, drums, glam rock, pop music, record player, rock music, the Beatles, vinyl. Bookmark the permalink.